The extensive collection of GTS papers has undergone a complete overhaul. With the update service in January 2014, 13 of the 25 existing papers were adapted to current requirements, one of which was a new addition – the GTS Flow Chart. The GTS papers comprise different guidelines, stipulations and information leaflets which regulate the association’s workflow procedures and certification. In the last issue of GTS-Strahl (No. 30, page XVI to XVII), we reported on the task of compiling the papers and the dedicated work being done by the GTS Quality Committee headed by Jens Putzier who regularly checks the papers and adapts them to existing conditions. The most important changes can be found in the rules governing the GTS Certificate. The obligation of full members to employ one European Thermal Sprayers (ETS) and one European Thermal Spraying Specialist (ETSS) respectively was added to the GTS Certificate Guideline (GTSPA002), the GTS Quality Management Guideline (GTSPA003) and the GTS Application Form (GTSPA004). With this change, GTS has adapted its prerequisites for GTS qualified sprayers and specialists to EWF guidelines and has therefore responded to the growing demand from both industry and customers. For old members a transition period until 1 January 2017 applies. After this transition time, it is intended that all GTS thermal spray specialists fulfil the requirements of the ETSS qualification. Sponsoring members are not affected by the changes. Furthermore, topics which are already obligatory for everyone were integrated in the GTS Quality Management Guideline (GTSPA003). These are quality (DIN EN ISO 9001), environmental protection (DIN EN ISO 14001), occupational health and safety (BS OHSAS 18001) and energy management (DIN EN ISO 50001). EExtensive changes were also necessary with respect to the paper “Statutory Regulations for Thermal Spraying” (GTSPA022 – in German only). This paper, compiled with the help of GTS members, Dieter Buhmann, Rad Systems Engineering GmbH, and Frank-W. Mütz, e-quipment GmbH, serves as guidance for operators of thermal spray systems in Germany and describes the prevailing statutory, industrial and governmental rules and regulations for the areas of building law, emissions and immissions, labour protection, hazardous substances, company doctors and specialists for occupational health and safety, risk management, energy and disposal. An equally extensive update was also provided for the GTS Multiple-Choice Questionnaire (GTSPA014) and the educational software GTSExam. The entire questionnaire was revised by the GTS Quality Committee and numerous questions were added. The questionnaire now comprises around 800 questions from all areas of thermal spraying and on each single spray process. 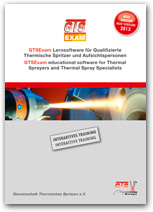 The interactive educational software contains all these questions in German, English and Dutch and is used by the independent inspection authority for the examinations “GTS Qualified Sprayer” and “GTS Thermal Spray Specialist”. For the examinee, the software offers an interactive mode with different learning and evaluation functions, also including the simulation of an exam situation. The software is available to GTS members free of charge as part of the GTS papers package. Non-members can purchase GTSExam from the GTS Head Office. For further information, please go to “Software” on the GTS website. The new paper “GTS Flow Chart” (GTSPA026) graphically illustrates the tasks of the different GTS committees and workflow procedures from the first enquiry about GTS membership through to GTS certification. All GTS papers are also available in PDF format and can be downloaded from the protected members’ area of the GTS website. The association’s statutes, the membership application form and several other important papers on the topic of certification can be accessed directly under “Download”. Last updated: 01/04/14 Home Copyright (C) 2014 GTS e.V.